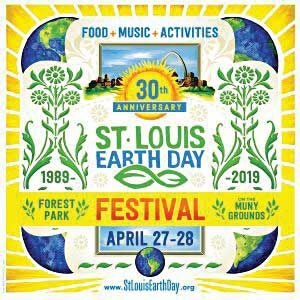 The 30th Anniversary St. Louis Earth Day Festival will be held Saturday and Sunday, April 27 and 28, on the Muny grounds at Forest Park. The festival runs from 11 a.m. to 5 p.m. each day. The St. Louis Earth Day Festival is a community tradition that helps the public learn about sustainable products and services offered by local businesses and organizations. Visitors can meet local area non-profits that share Earth Day values, enjoy local entertainment and St. Louis area Green Dining Alliance restaurants. A free shuttle from the parking lot at St. Louis Community College-Forest Park runs every 15 minutes, from 10:30 a.m. to 5:30 p.m. both days of the festival. Those taking MetroLink should get off at the Forest Park/DeBaliviere Station and walk about a half-mile to the festival. For more information, visit earthday-365.org/festival.